If you are feeling powerless and frustrated at what is transpiring in Washington and Columbus, and even with the Trolleys and other wasted money right here at home, you are not alone. But there IS something you can do about it. 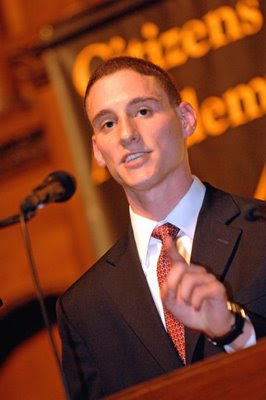 Republican State Representative Josh Mandel has confronted liberalism right in his own backyard, and he has won important battles. Hear his story – and learn how conservatives can win tough fights even in hostile territory and among sell-outs in his own party. Please join us for our COAST general membership meeting Wednesday, April 1, from 7-9 PM at Molley Malone’s in Pleasant Ridge. There, you and fellow COASTers will hear the message of Josh Mandel will begin to implement our 2009 action agenda to drive the tax-and-spenders crazy. Your participation is part of our success. Please come and plot our 2009 strategies. Yeah, it’s important. Really important.